During IBC 2016, I had the privilege of meeting official representatives from Sharjah Media Corporation for the first time. Shortly thereafter in 2017 NOA received an order from the broadcaster for our unique Archive Asset Management (AAM) system mediARC. The companies have now also signed a multi-year service maintenance agreement confirming SMC’s trust in NOA solutions and a long-term partnership. Of course this order, being the first project for us in the United Arab Emirates, was significant for NOA. But more importantly, it represented the unification of those of us, from different nations and cultures, who have a common goal — the preservation of history. 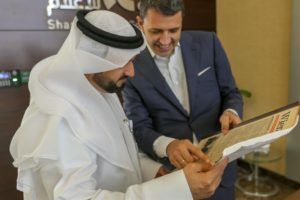 To honor our newfound working relationship and NOA’s commitment to safeguarding history, I decided to visit Sharjah’s director general, Mr. Mohammed Assan Khalef, and express my gratitude with a special present. Being a history lover, I found and obtained the original issue of the “Wiener Zeitung” dated Dec. 3, 1971 in which there is an article, written in German, detailing the birth of the United Arab Emirates. For me, it was important to express our gratitude for the trust the SMC had given NOA, and to emphasize that doing business is never unilateral but that the human aspect of our actions goes beyond financial and technological aspects. NOA is in this business not only because we are engineers but also because we love sharing our passion for history and technology. And it is precisely through technology that we are able to invest in something bigger, more precious — in history and archives for future generations. SMC is using the NOA mediARC solution to digitize and manage its entire legacy video archive, which consists of 140,000 hours of Betacam, DigiBeta, U-matic, One Inch, and MiniDV tapes. This means the media house can now preserve the majority of the country’s media heritage for future generations, and this is a priceless gift and an action I respect tremendously.